Don’t cut your grass too short. Leaving it higher will usually provide for a deeper root system, and helps to prevent weeds. Don’t remove any more than one third of the grass leaf at any one cutting. If your lawn happens to get too tall divide it into several mowings and get caught up with three or four days between mowings. 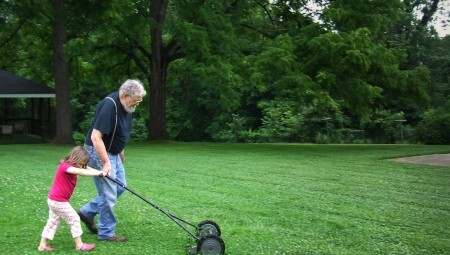 Mow your lawn in a different direction with each mowing, especially with lawns of shorter grass types. Changing directions will provide a more even cut because grass blades will grow more erect and will be less likely to develop into a set growth pattern. Keep your mower’s blade sharp. Either sharpen it yourself or have a professional do it several times during the mowing season. You could keep several blades around so you’ll always have a sharp one on hand. Change your mower’s oil at least once during the mowing season. Use fresh gasoline to begin the new mowing season.